Alternatives? 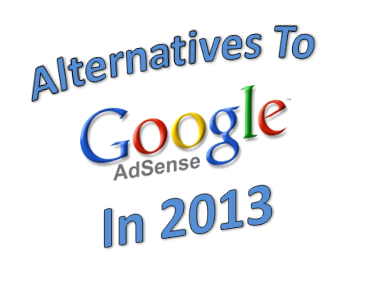 Why should you see for alternative for Google Adsense. Many Blogger start a blog and Apply for Google Adsense but get rejected due to many factors.Depending on Google Adsense alone is not a Good idea because its will take you so long to start generating Income for it. However having more than one source of income can get your pay even high I mean by adding all the sites pays because Google adsenes is the highest paying site till this date no one is in near compition with Adsenes. Having More paying sites in contact can maximize your per month income by summing up all the Income. Getting the right alternative for adsense is most important. These are 5 alternative’s of Google Adsense. Now don’t just depend on adsense when you can make extra cash by using the above mentioned.